Get the Book SUGAR SHOCK! 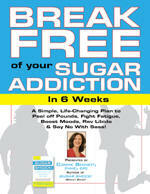 Get My Book SUGAR SHOCK! Michael R. Eades: Protein Power: The High-Protein/Low Carbohydrate Way to Lose Weight, Feel Fit, and Boost Your Health-in Just Weeks! Dr. Janet Starr Hull, Contributing Author Lynn Townsend Dealey: Splenda® Is It Safe Or Not? Agave is Worse for You than High Fructose Corn Syrup (HFCS): Please Stay Away From the Stuff! 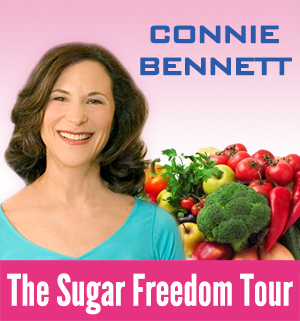 Connie Bennett is the bestselling author of Beyond Sugar Shock and Sugar Shock. The former sugar addict reluctantly quit sugar in 1998, and now 15-plus years later, she's considered The Sugar Liberator™, who has helped thousands of people worldwide discover that Life is Sweeter When Sugar Doesn’t Seduce You™. Thank you, wonderful readers, for continuing to visit this Sugar Shock Blog although I've been gone a lot due to my mom's terminal illness over the last year and lately have been grieving over her recent death. Suzanne Somers -- Catch her amazing interview now. CBS News Sunday Morning: Learn How "Americans May Be Too Sweet On Sugar"